47 talented young athletes from Cardiff will benefit from a fund worth over £24,000 – thanks to charitable social enterprise GLL. The athletes will be supported through the ground breaking GLL Sport Foundation (GSF), the largest independent athlete support programme in the UK. 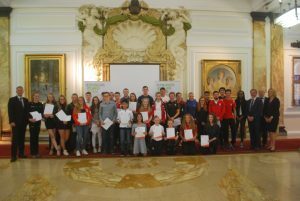 The awards support was announced on Tuesday 27th June at Cardiff City Hall with core partner organisations in attendance including Cardiff City Council, Sport Wales, SportsAid Cymru Wales, Cardiff Metropolitan University and representatives from the local advisory panel. These stakeholders were joined by 35 athletes and their guests. The athlete awards cover Olympic, Paralympic, Deaflympic, Special Olympic and Commonwealth sporting disciplines. With a staggering 92% of award recipients receiving no other sport funding and 89% of recipients being aged under 21, the Sport Foundation has highlighted a vital funding gap for young talented athletes currently competing at national and international levels. On the evening GSF supported ambassador Joseph Choong attended to showcase and explain how the support has aided his sporting journeys. Joseph, Rio 2016 GB modern pentathlete, stated “The support of the GLL Sport Foundation plays a vital role for athletes as it has done for me transitioning from a junior to international and now Olympian. I know it will make a positive impact to athletes here in Cardiff, it will be great to see some of these athletes here tonight develop further to represent Wales and GB at the highest levels”. Cardiff supported athlete Hannah Roberts-Straw, a 15 year old junior GB sailer is transitioning through a pathway to an eventual Olympic boat discipline. “The funding and support will help me progress quickly in terms of equipment, coaching and competition costs”. Wales women rugby 7s captain Elinor Snowsill, a fellow supported athlete, during a Q&A section talked through her competitions focussing on the World Cup, then the Commonwealth and longer term the Tokyo 2020 Olympic Games “These competitions are what the team and I are working towards, and the support from the GLL Sport Foundation will support this journey”. Since its launch in 2007, the GSF has provided over 13,000 athlete awards at a total support value of over £7.5million across the UK. The Rio Olympics and Paralympics were historic successes for Team GB, and the GSF supported athletes also broke the Foundation’s record medal haul with 20 medals won between them.